Here we will show how to synchronize Sansan business card data with the contact list in your telephone. You cannot directly synchronize Sansan with the contact list on your smartphone, but you can connect the Sansan data with your Google Contacts, and then synchronize Google Contacts with the contact list in your smartphone. * You will need to register accounts for both Google Contacts and Zapier. * For questions about these services, please contact Google or Zapier. Step 1. Download Sansan data into a CSV file. Step 2. Import the CSV file to Google Contacts. Step 3. Synchronize Google Contacts with your smartphone contacts. 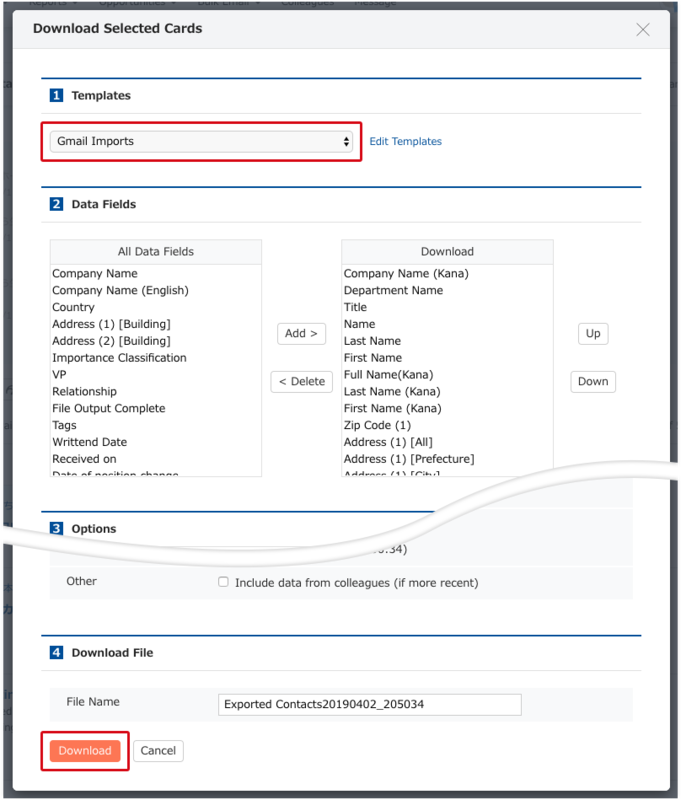 Select the business cards you want to connect, and then from "Download", select "Download selected Cards"
If you select the "Gmail Imports" template, you can use this format for importing into Google contacts. - Please check here when downloading Sansan business card data. After downloading the CSV file from Sansan, import it to Google Contacts. Please check if the Sansan data has been imported to your contact list. From "Settings", go to "Email / Contacts / Calendar", then to "Add account". Add the Google account, and then put a check in "Contact list". When the Google Contact data has been synchronized with the contact list in the iPhone, the procedure is complete. From "Settings", go to "Accounts and Syncing" or "Accounts", and then choose the Google account. Synchronize the contact lists. When the Google Contact has been synchronized, the procedure is complete. Step 1. Create a Zap to connect Sansan and Google contacts. Step 2. When a new business card has been changed into data, it will automatically be connected. Log in to Zapier, and create a Zap for connecting Sansan and Google. When making the Zap, you will need permission for connecting with Zapier and an API key. The API key can checked from "Settings", "3rd Party Integration". -For more details about connecting with Zapier, please see here. Once the Zap test is complete, please check if it is functioning regularly, and then the procedure is complete. When new business cards are digitized, they will be connected to Google Contacts via Zapier.